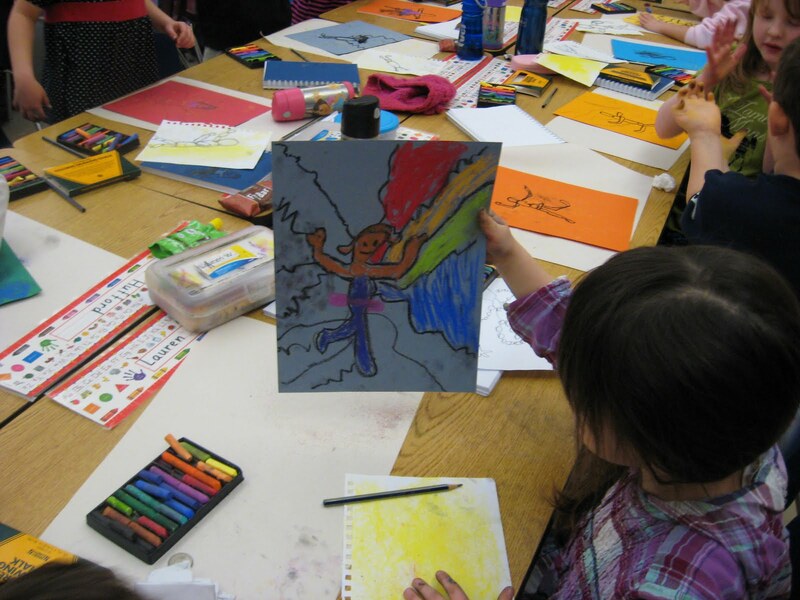 Schmitz Park Elementary School in West Seattle has a unique all-school, arts-inclusion program. The program was designed to serve all students at all grade levels throughout the year with a curriculum constructed to be delivered by the extant faculty. This plan, which took six months, a solid chunk of PTA funds, an auction, and a grant or two to develop, is available to any school principal to implement if they ask nicely. While not necessarily a substitute for a full-time art teacher, it’s an excellent means of including the visual arts in its learning plan for a school that chooses not to have a designated arts instructor on staff. It’s like Art Theory 101 for elementary school kids. I had to wait till college to get some of the information Schmitz Park students learn in first grade. And it all came to be through the efforts of one Schmitz Park parent. Not your average parent however. A very Rare Bird. Kathleen Allen, the former Arts Liaison for the Seattle Public School District with degrees from Vassar, Harvard and the University of Washington. Before being hired as Arts Liaison for the District, Kathleen worked with Arts Impact for five years, and before that she was the Manager of School and Teacher Programs at the Seattle Art Museum (SAM). She is now Director of Education, Communications and Partnerships for the Seattle Youth Symphony Orchestras. If only we had a whole flock of her at every school. We don’t, but as I mentioned, the lesson plans for this program are available for the asking. Tell them I sent you. Like I said, a whole flock would be nice. 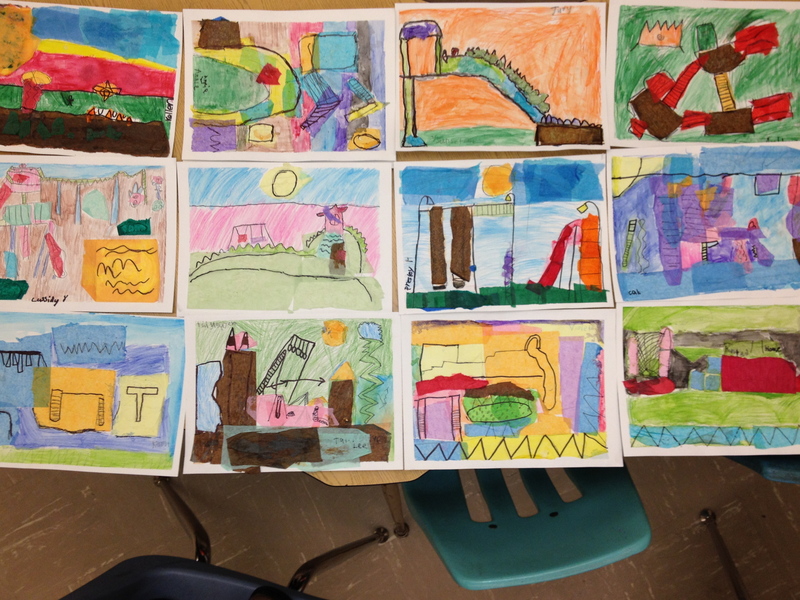 Initially, Kathleen taught monthly art lessons to her daughter’s kindergarten class. Although the teacher thought this was great for her students, she asked Kathleen if there was a way to expand the idea to reach every student at Schmitz Park. Kathleen then approached the principal and met with staff in a series of collaborative conversations about bringing visual arts instruction to their school. She learned that the majority of teachers wanted to be able to teach visual art — and drawing skills in particular — as part of their curriculum rather than have an art teacher on staff. They also preferred that someone be brought in to their classrooms to mentor them in arts instruction, rather than be required to attend training workshops off site. Starting with some surplus PTA funds (times have changed, haven’t they?) and later adding auction money and grant awards, Kathleen brought in Beverly Harding-Buehler, a teaching artist and colleague from her days at Arts Impact and SAM. Together Kathleen, Beverly, the principal and a representative group of staff designed a sequential curriculum with a three-year implementation plan. In developing the curriculum itself, Beverly began with resources the school already possessed. 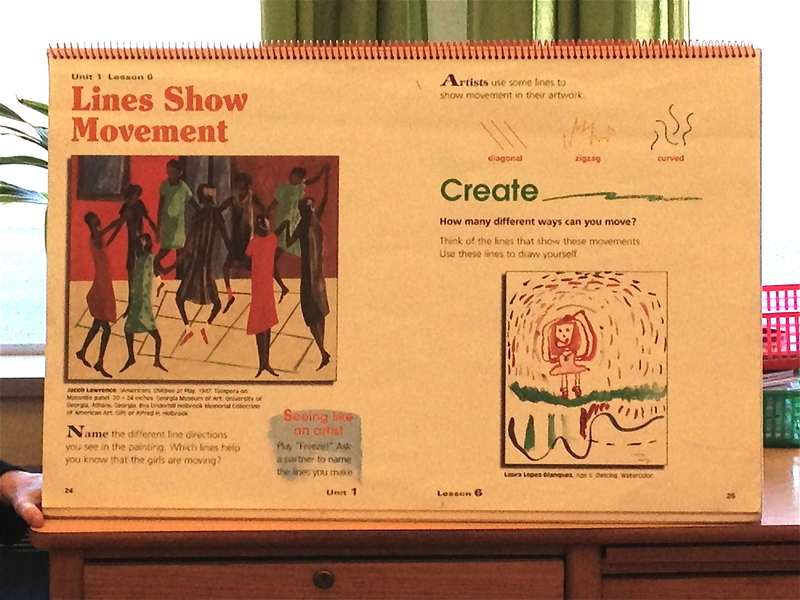 A decade or so before, the district had purchased art poster sets and textbooks, but provided no training on how to utilize them. Kathleen found the materials in the storage room, blew the dust off and passed them on to Beverly who used the lessons as a basis for her study plans, expanding them to include references to local works of art, many of them at SAM. During year one, Beverly came in and led the lessons, working as a teaching model demonstrating techniques and referencing artworks. 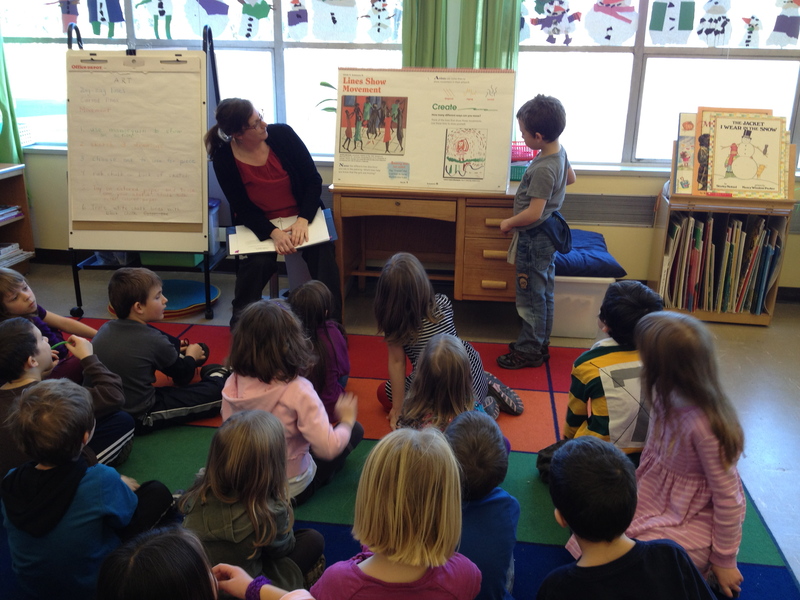 The second year she co-instructed each lesson. By the third year she was able to step back and let each classroom teacher instruct, serving as a guide when issues arose. This gradual transfer of information was designed to support the staff through the training period so that by the fourth year, they would be confident in leading the arts instruction independently. While some still expressed anxiety about teaching art on their own (and art anxiety is not unique to them, but that is a subject for another post) most adopted the new teaching plan with enthusiasm. Each grade level gets two art lessons per month each year. 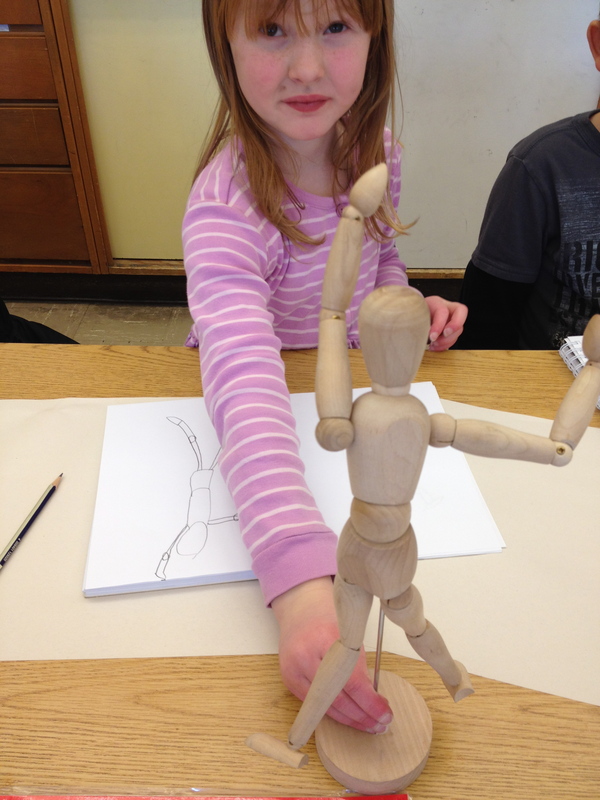 That is a total of six lessons–twelve hours of visual art instruction–per grade level. 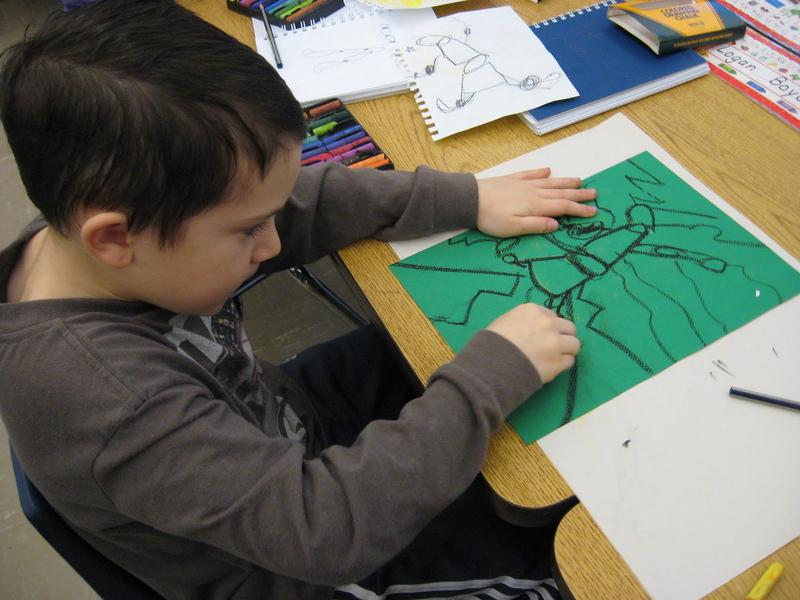 While not the same as having a full-time art teacher on staff, it is still better than foregoing arts instruction because of budget or faculty limitations. However, after observing a lesson, talking with staff and viewing some of the resultant artwork, I was impressed by the depth of information and direction these students are receiving. The sequential learning structure progresses with each lesson building off the preceding one, eventually covering all the The Essential Academic Learning Requirements (EALRs) of visual art while also teaching technical skills. Take a look at the Schmitz Park Visual Art Scope and Sequence Outline. It’s pretty enough to frame (I think anything this well organized is beautiful). The philosophy behind the curriculum focuses on concept rather than product. Students don’t just draw a happy cow, they learn about visual arts principles–qualities of line, geometric and organic shapes, color theory, pattern and rhythm–while working on each assignment. As a working artist I can testify that this information has far more long-term value than how to make a ladybug out of a paper plate. The lessons hinge on the belief that every child can be an artist; not that every child will exhibit at MoMA some day, but that what they create has intention and value. 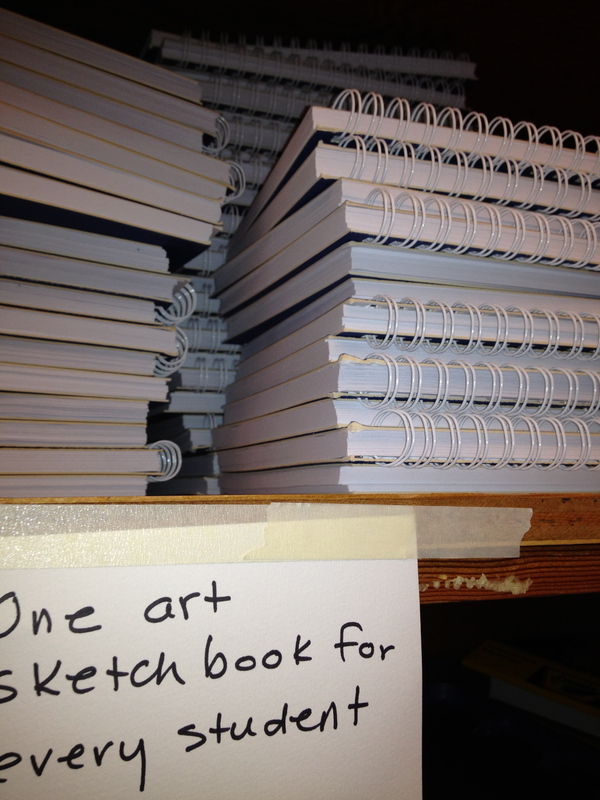 In addition, each student receives a sketchbook of his or her own at the start of the school year. 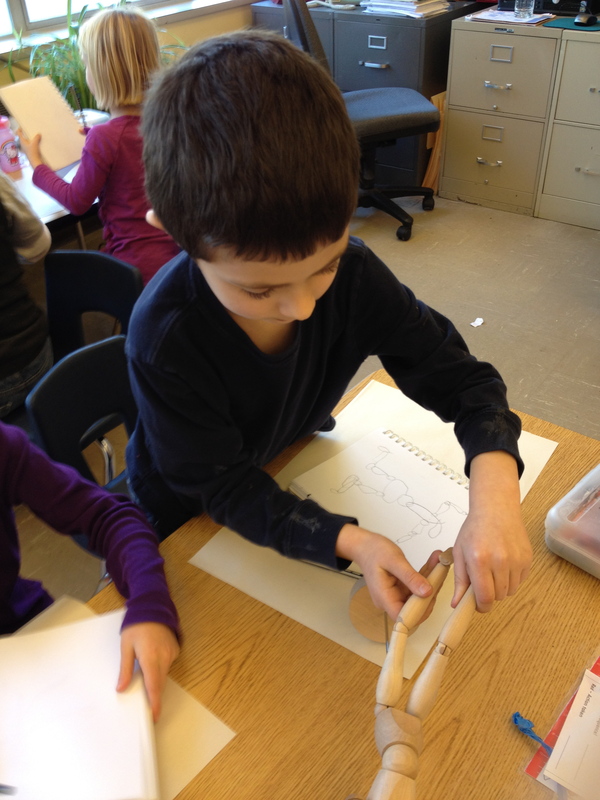 I observed the “Lines Show Movement” lesson in Beth Grasel’s first grade class a few weeks ago. The kids jumped right into the project. It was wonderful to see. I also spoke with Dave McMillin, currently the lead teacher for the Visual Art program. Dave proudly laid out some of the tissue paper collage pieces created by his second grade class for their “Lines Have Names” lesson, working with the concept of line direction for expressive effect. Finally, to support the teachers going forward Kathleen and Terri Goodwin, another Schmitz Park parent and local ceramic artist, created a parent art volunteer corps that trains in the classroom as assistants for the art lessons. The volunteer corps is now in its second year. And the program is going forward. The current principal Gerrit Kischner came in during the second year of its implementation and has since made its longevity a priority. 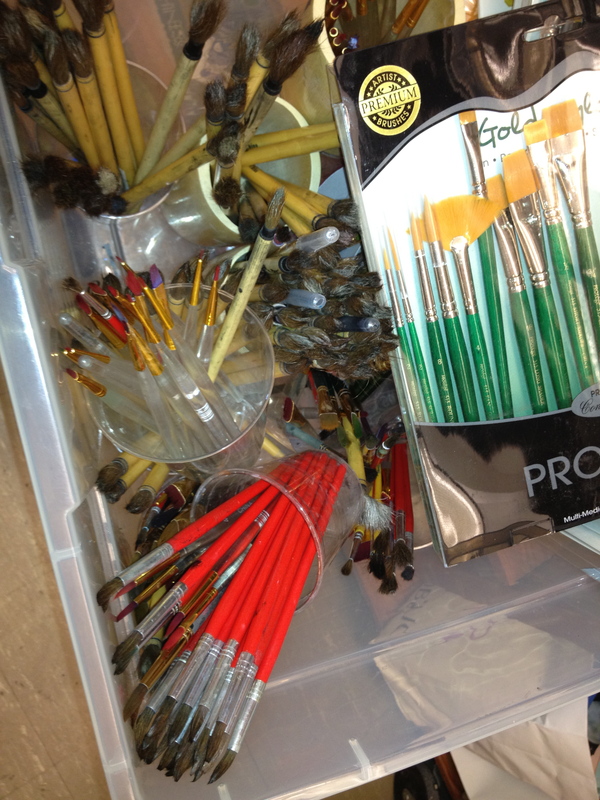 Art supplies are included in the school’s annual supply budget making them part of the operating costs paid for by district. Significantly, the program is now embedded into the system and is no longer dependent on PTA financial support to continue. Think ahead to how your program can become sustainable — Programs initiated by parent volunteers often dissipate when that parent “ages out” of the school. Eventually other parents and/or staff members will have to take over duties such as scheduling parent art volunteers and SAM field trips. Remember to budget for Professional Development time for your teachers — If enrollment grows and new staff are added, your teaching artist will need to come back to train them on specific teaching techniques. Previously trained staff should support their new colleagues by going over the lesson plans with them. 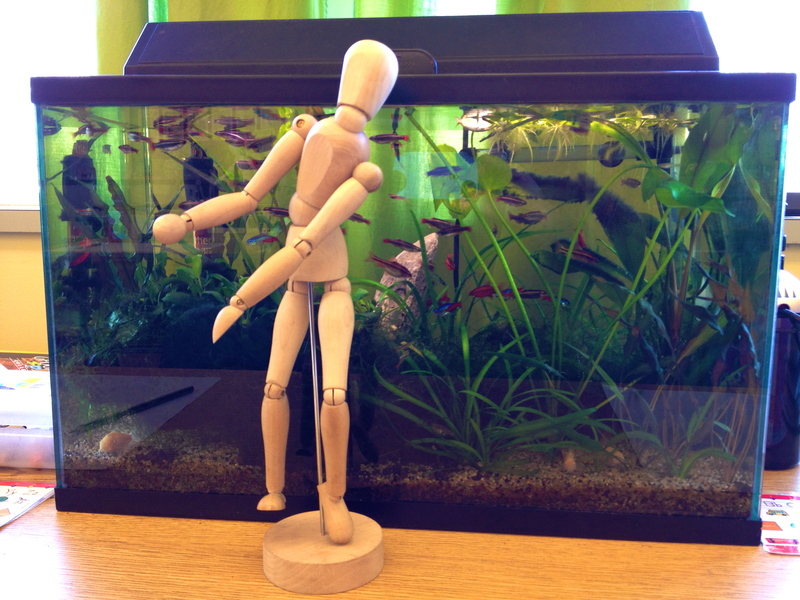 Any time you hire a teaching artist, ask them, What are you going to leave for us? Lesson plans? A technique we can feel confident continuing with? And consider what it means to have children learning art concepts in elementary school in addition to their core curricula. Alumni of Schmitz Park will eventually be adults who know something about creating and appreciating art. This entry was posted in Art and learning, Arts advocacy, arts education liaison, elementary school arts programs, Fundraising, Seattle Public Schools and tagged arts and learning, arts EALRs, arts education, arts enrichment, arts in public schools, arts in schools, arts inclusion, arts liaison, elementary school art lesson plans, elementary school arts education, Kathleen Allen, Pebbles In The Jar, Schmitz Park Elementary, Seattle Public Schools arts inclusion. Bookmark the permalink. This is so inspirational. You are so inspirational. Thanks. 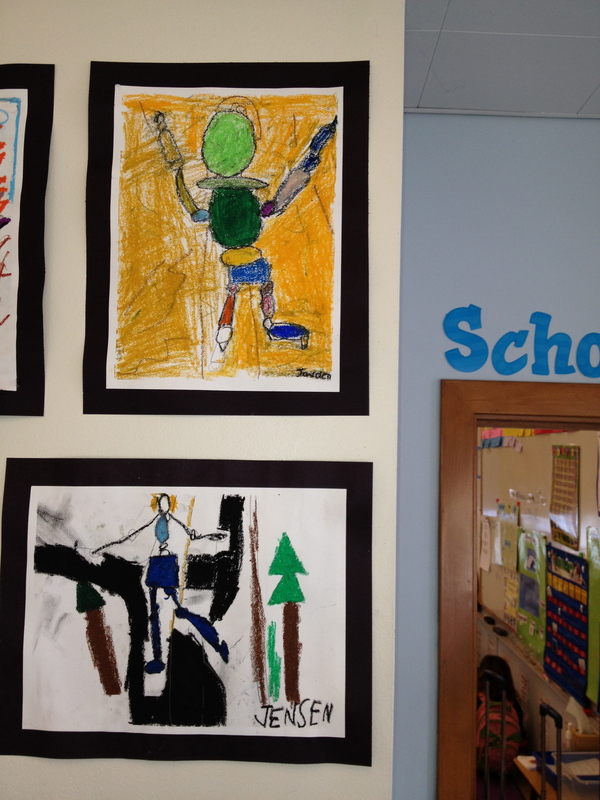 I loved seeing the art that the children made in this post. Many children (and adults) mistakenly believe that skill in art is something that comes from a divine grant; you either have it or you don’t. But art is like anything else – you get better by working at it. A sequential program like this gives every student the tools to express that spark within themselves. It provides a scaffolding upon which they can grow. Thanks so much to Kathleen Allen for building such a strong scaffolding, and for educating the community as well as the kids. And thanks to Margaret for explaining it in such detail. I hope this method spreads.